Have you ever googled “internet dating”? If you do, you will get about 26,800,000 results in 0.17 seconds. I have not had to google this term before, but having been recently accused of some behaviour I thought I would. So, supposedly I set up a fake persona to ‘date’ someone. That means that out of the millions of websites out there that deal with internet dating, I chose the same one that she did. And then I created a persona that would match her criteria! So, once I had got the right website, I would have to find the right person. Given that people use avatar’s and screen names, this in itself would have been quite a feat. But, I have been accused of being capable of this. I am so clever apparently that I have been told I maintained this ‘affair’ for quite some time. I am not sure how I managed to do all of this, but it goes to confirm one thing for me – I am always going to be responsible in this person’s mind for all the bad things that befall her. Apparently, I am the source of all evil, much like Eve in the Garden of Eden when she accepted the apple, it was all the snake’s fault! It is much easier to blame me, than take responsibility herself. 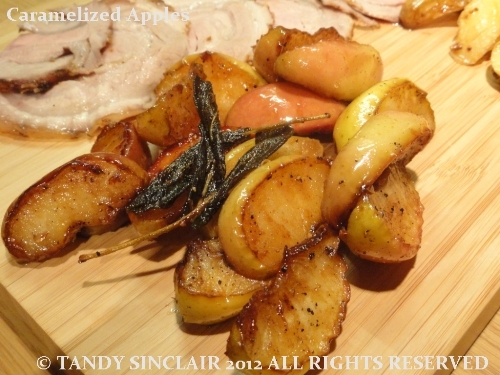 As for apples, well, they make the perfect accompaniment to a roast pork in my opinion and are better served up simply cooked, when you want more than a sauce. Wow, Tandy, it is soooooo not nice to have people like that in your life – ban her! The apples are sounding delicious! Sometimes people just need someone to blame… I loved caramelized apples as a child and this recipe sounds perfect for the “grown up” me. Thanks for sharing 🙂 ! Oh Tandy, it is not pleasant to have people like that in your life is it? Sorry to hear about what you’ve been going through! thanks Lorraine, thankfully she is not a part of my life! Whoever is accusing you of such things sounds, well. Crazy. These apples sound crazy also. CRAZY DELICIOUS, that is! Hehehe…looks like there is more to you than meets the eye! Those apples look good Tandy! The other stuff can be quite hurtful. Thats good Tandy, glad to hear. At least these delish caramel apples could have made you feel better! Which sound divine by the way! I am still amazed at people, just when you think you know someone,..they’ll throw something at you that really hurts…people surprise me everyday! it is sad that people can hurt others so willingly! Crikey, that’s quite some story! Poor you. At least you got to eat that delicious looking pork with those yummy apples to cheer yourself up 😉 Love the simplicity of this and one I will be trying. it is very simple to make 🙂 I thought the whole thing a laugh, but it has taken me a while to write about it! Oh my word! what a thing to be accused of. Perhaps you should make this lovely apple dish and tell the accuser where to shove it…ooopps! that might have been a bit out of line.